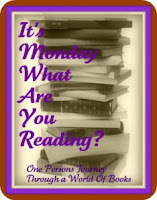 Kritters Ramblings: It's Monday, What are you Reading? A GREAT week in reading! I had a few nights with some fantastic reading while taking a break from the house projects. Looks like you had a good week of reading. I just read your Baltimore book post and wow, you hit the motherlode with your shopping! Enjoy your coming week of reading! You did get a lot of reading done. I enjoyed reading about your book weekend with your mother too. You got an amazing assortment of books. Come see what I did last week here. Happy reading this week! GRE study guides. My test date is just about two months away and studying is consuming just about every free moment.